YUM! GAPS friendly savory smoky hash browns for breakfast! There are a few things that my family misses most when on the GAPS diet. One of them is potatoes. Honestly, I have never liked potatoes, but that is probably because I am very allergic to them, and my body knows better. Before half of us started GAPS, my dad always used to make a big batch of skillet potatoes on the weekend and people would nibble on them right off the stove. By the time they were all done, there were hardly any left :). Now when my family has potatoes, those of us on GAPS (who like potatoes) sometimes feel left out. Being on the GAPs diet should not leave you feeling like you are missing out. You are gaining so much from doing this diet! Someday you will be able to have potatoes again, but you need to heal your gut first! So, to ease the potato craving, I decided to create a sort of substitute, using celery root (which is GAPS friendly). At my house, those hash browns are always good to have on hand for a quick meal for my brother, dad, or younger sister not on GAPS. I wanted to make something kind of like that for of us on GAPS. Since potatoes are usually a breakfast thing at my house, I wanted to create something unique with breakfast flavors. 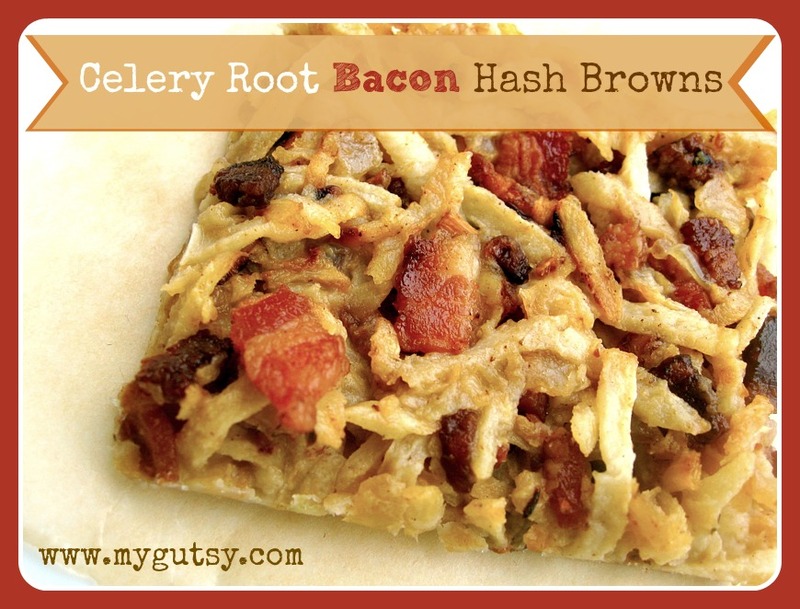 That is when I thought of celery root bacon hash browns! Celery root makes a good stable alternative to potatoes. When you are shredding the celery root, the smell will be strong, but don’t let that stop you from making these. When celery root is cooked, the texture, taste and smell resemble potatoes. The bacon really adds a nice flavor that helps cover up the “vegetable” taste of the celery root. 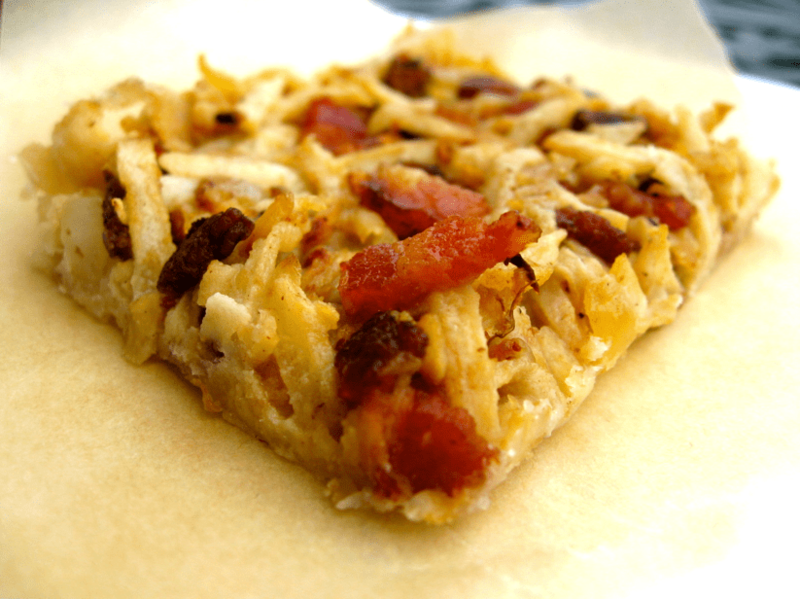 I designed the recipe so the celery root hash browns can be kept in the freezer for an easy breakfast. I pre-cooked them and then froze them into squares. So, when breakfast or lunch comes around, all you have to do is pop one out and put it on the stove or a baking sheet until golden brown! 1.Dice your bacon and add to the skillet. 2. Dice your onion and add to the same skillet. I used leftover bacon fat. 3. Add the 4 TBS of fat to the skillet and brown everything together. 4. Wash the outside of your celery root. 5. Cut the skin off of the celery root. *Save the skin for your chicken or vegetable stock! 6. Quarter the celery root to fit into your Cuisinart (I use this one). 7. Use your Cuisinart (thick shredder side) to shred the celery root. * You can also use a normal grater. 8. Add the celery root to the skillet and cook down for a few minutes. 9. Scoop the mixture out of the skillet and press down onto a baking sheet (I only used 1/2 of baking sheet. The flat sheet makes it easier to cut on than a baking pan). 10. Freeze for about 1 hour until hardened and cut it into squares. 11. Separate the squares with a knife or spatula. 12. Store in a container or plastic bag layered with unbleached parchment paper. Heat up a skillet. No extra fat needed! Add your frozen hash brown and cook until golden brown. Place your hash browns on the baking sheet and cook for 15-20 minutes. This is what the “hash browns” look like when you take them out of the freezer. A nice perfect square! This what the hash browns look like when you cook them. They fall apart into a little pile of yummy breakfast goodness! This looks like a very little pile, but they are rich and nutrient dense! Love it!! Sounds delicious! I miss potatoes something fierce! I doubt that I will ever be able to eat them again… But recipes like this make it all ok! Thanks for sharing!! These look awesome! And so simple. We do eat a little potato, but I am always looking for a more nutritious alternative that fulfills that starch/fat/salt craving. This sounds great. I’ve never cooked with celery root but whenever I’ve had it out at restaurants I’ve always loved it. And it looks so simple. Thanks for sharing! This is going on my ‘to make’ lists! It is definitely easy to make and celery root cooks a lot faster then potato. The thing is..you have to make GAPS food or any homemade food in a big amount and then freeze it so you can take it out for an easy meal! What a great Breakfast treat, this would be delicious! Hope you are having a fantastic week and thank you so much for sharing with Full Plate Thursday. Your recipe is featured on Full Plate Thursday this week. Hope you have a great summer week end and enjoy your new Red Plate. I actually tried making my own celeriac (which is what we call “celery root” in Australia) hash browns last weekend. They were a little bit soggy though. I can’t wait to try your recipe now! Yuuuuum! These are not soggy! be sure to crisp them up too. thanks for stopping by !! I miss hash browns. I didn’t know celery root would be a good substitute. Now to find some to try this recipe. Thanks, Caroline! I put mine in muffin tins before freezing. they needed a splash of hot water underneath to get them out, but it was quick & easy. Where do you find GAPS-legal bacon? I just mde celery root fried for my Gaps girl last nite! Was so thrilled w the similarity to a potato!! When my girl is happy- I’m happy! I cannot wait to make this for her! !